The document section provides access to all the material produced under the project in view of its dissemination and use in the Mediterranean coastal States and their respective regions. The POSOW I material which is composed of Manuals, PowerPoint Presentations, Posters, Videos, etc. was uploaded upon completion all along the project implementation. They can be downloadable from the respective sub-menus of the document section. 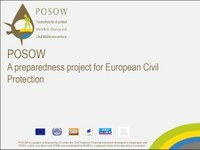 The POSOW II material will be uploaded throughout the implementation of the second phase of the project. Within the framework of POSOW I, the Posters and Presentations were made available in the six languages of the beneficiary countries of the Project. During the implementation of the POSOW II, the Posters and Presentations will be made available in Arabic and Turkish.